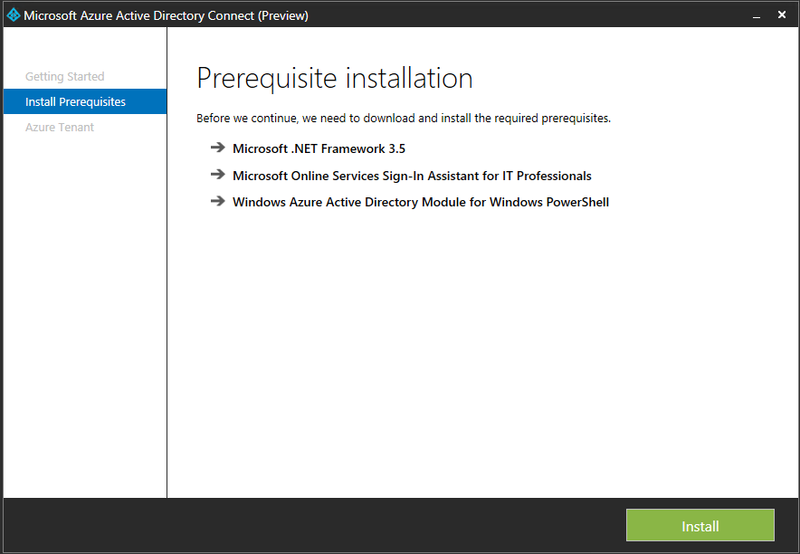 Uninstall any previous versions of Office 2013 and Project and Visio. Run the following to install Office 2016. The installer will start up. The installer will minimise to the taskbar. Run the following to install Project 2016. 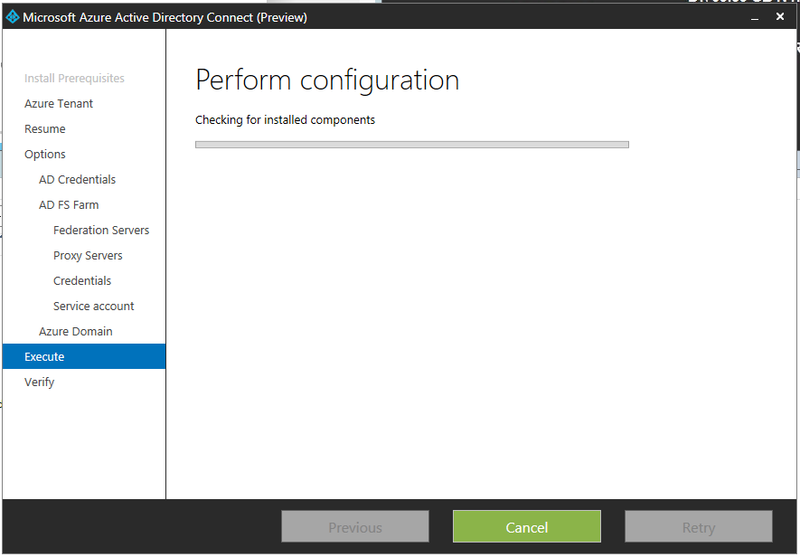 Run the following to install Visio 2016. Enter your registered details to Trial Software. I am running Windows 10 build 9926. I get the following error when I use the snipping tool and I attempt to email from within the tool (Via Outlook 2016). You only get a few days grace without a valid license. 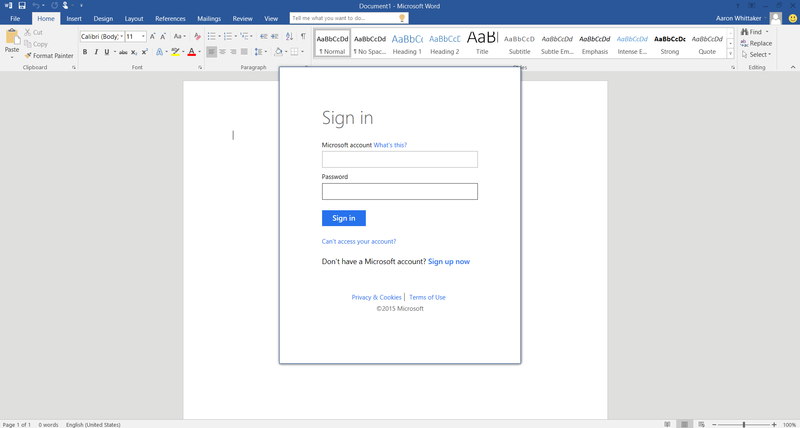 How to activate -> you simply need enter credentials for a valid Office 365 mailbox. No other licenses/key will work. Microsoft have updated the popular Skills and Certification Roadmap to reflect the latest skills development and certification information, including the new Devices MCSE, Azure exams and exam electives. For certification pathways, download the roadmap as a PDF here. 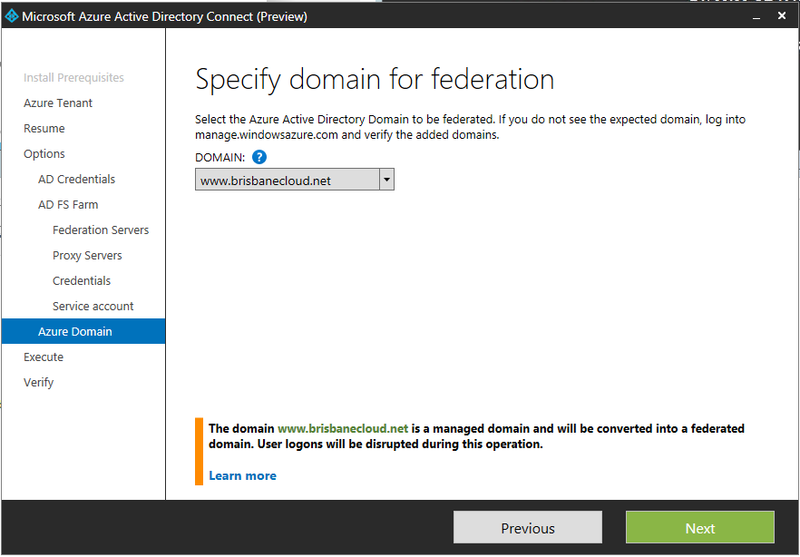 Definitely worth a read before implementing any DR to Microsoft Azure plan. 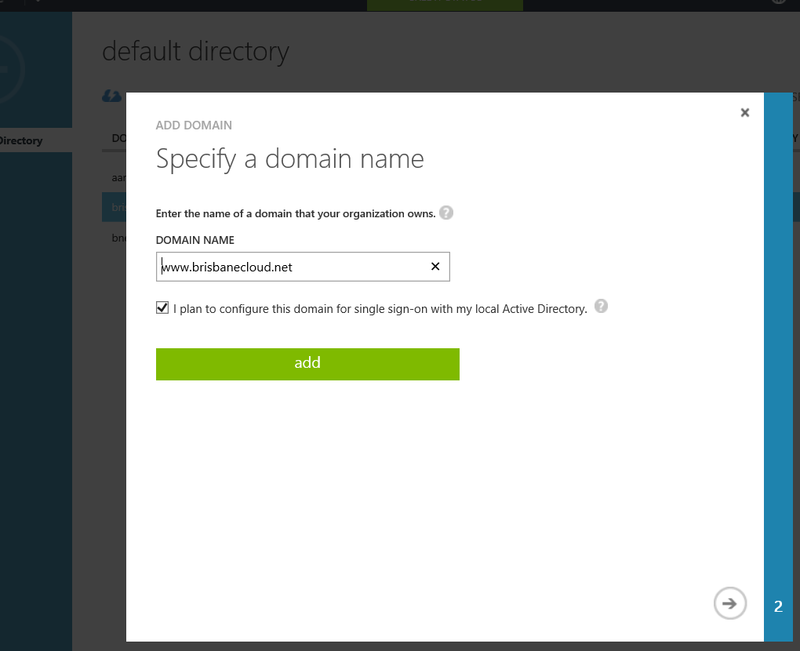 Recently I defederated my domain from Office 365. I followed these steps here. Interestingly the passwords.txt file remained empty. Old documentation says that it will enter user passwords here. I tried the command without specifying a password file. It still prompted me for this. End result was this still worked and the domain was defederated. 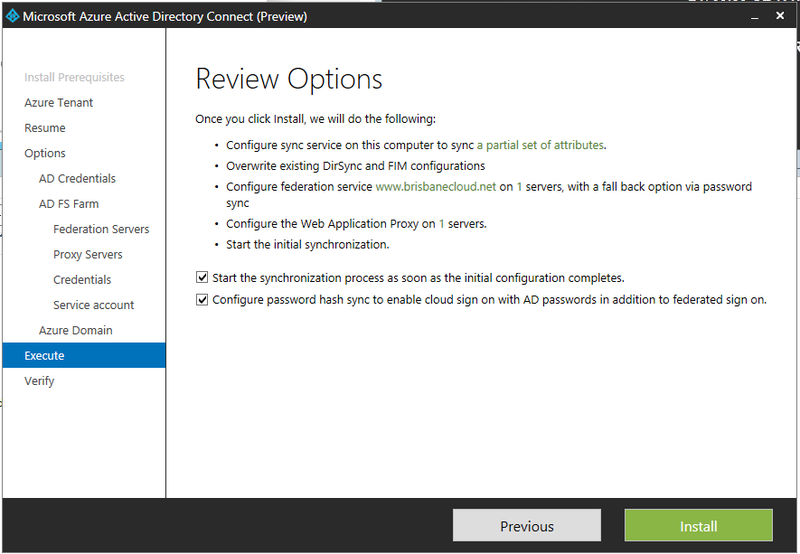 Ingredients Required: AADSync MicrosoftAzureActiveDirectoryConnect.msi installer from the BETA program (using version 3.7.1224), Domain Controller, Office 365 subscription, Azure, 2 Windows 2012 R2 domain joined servers, Public trusted certificate and a valid domain. The first time I tried this exercise I did not have a public trusted certificate. 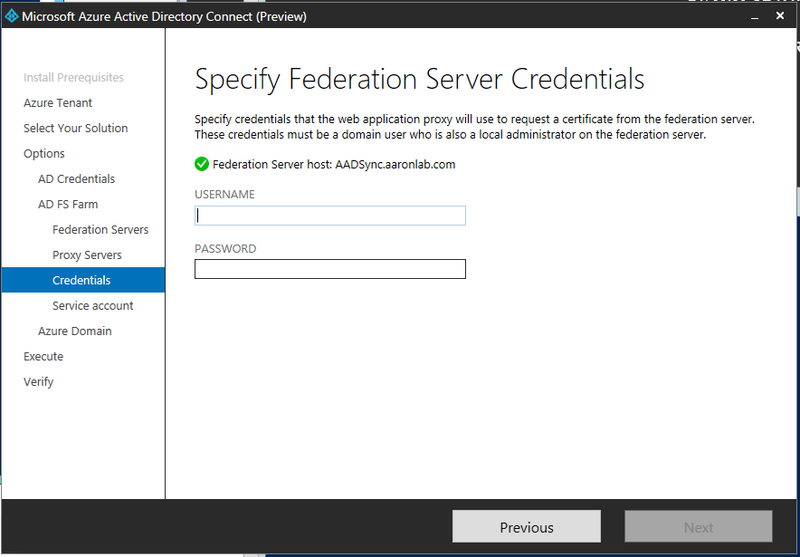 I tried a Self Signed certificate but it did not work (Azure documentation says that it should). So I purchased a domain, so I could a valid public certificate. My existing environment consisted of a DC and a DirSync server. I simply turned off the DirSync server and created a new server called AADSync and a WebAppProxy. 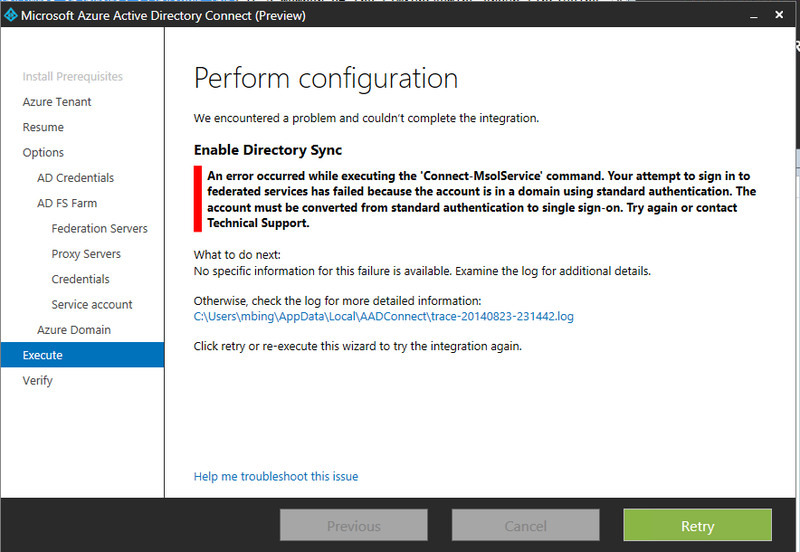 This normally leaves the sync’ed users populated in your Azure AD. This was not an issue for me as the new DirSync server will take over, or I could have manually removed the now ‘In Cloud’ users. 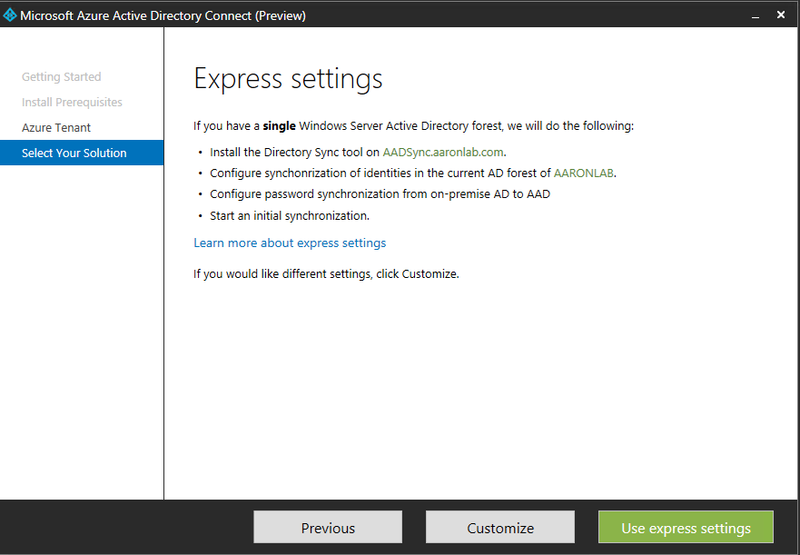 I installed DirSync just via running the new AADSync DirectorySyncTool.exe installer (just using the default SQLExpress) and just configured and installed DirSync. This was because I didnt have the certificate. 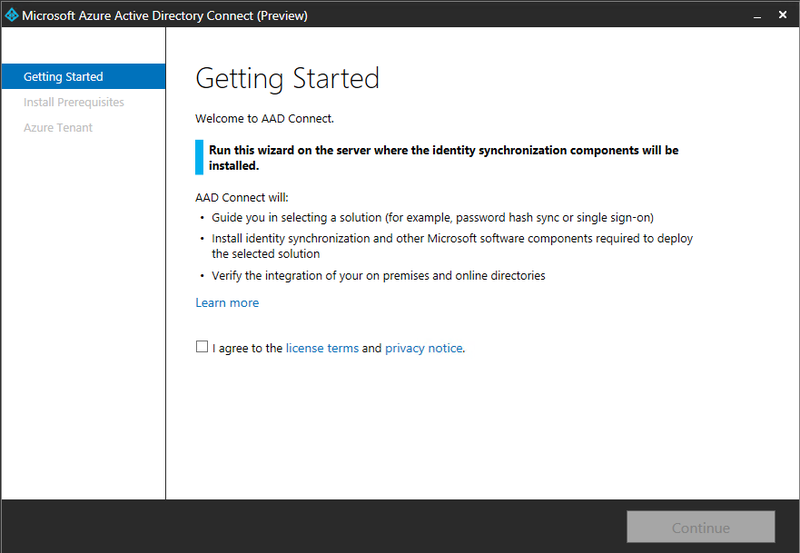 I ran the MicrosoftAzureActiveDirectoryConnect.msi installer on my server named AADSync. The installer is only 976kb so it downloading all files as required. 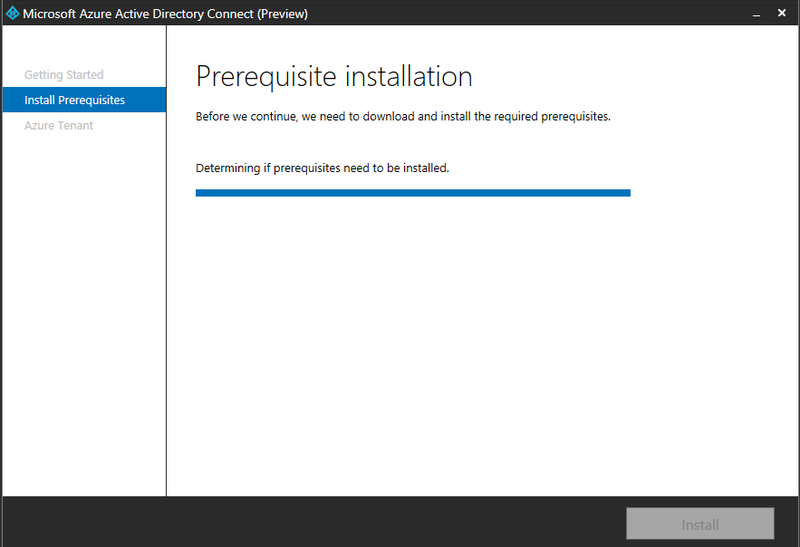 The installer now installs the pre-requirements if required which is a nice feature! I selected single AD forest. I selected Single Sign On. 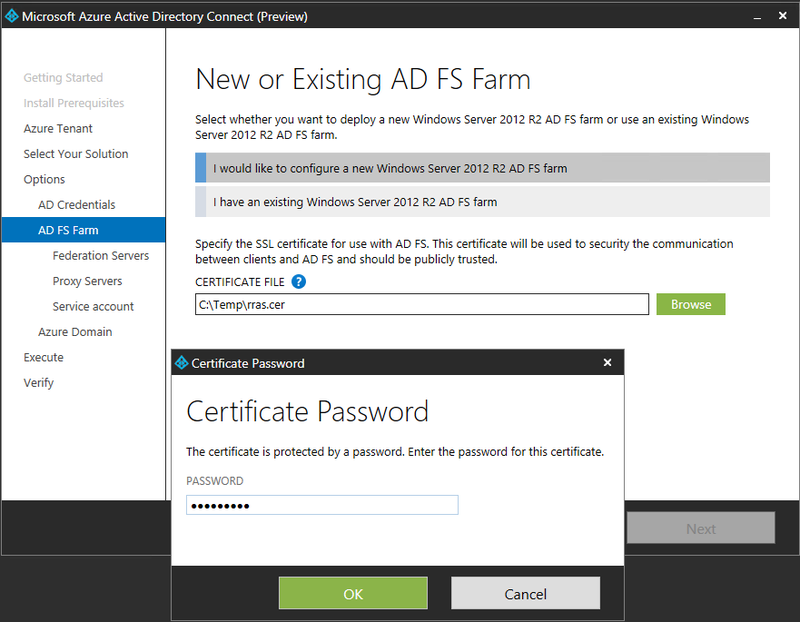 Entered my local Domain Admin credentials. Error: Here is where I ran into my first issue. I only had a .cer file, once I made a self signed .pxf I still could not proceed. I pressed back several times and proceeded with Express settings. 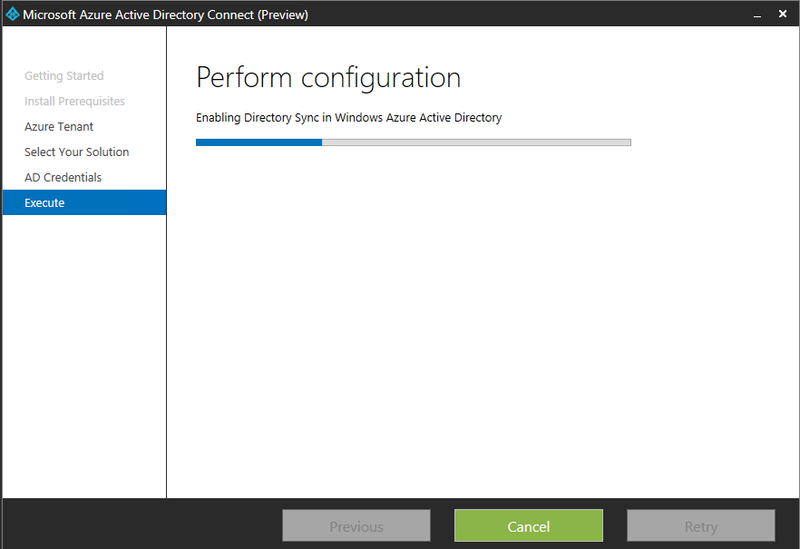 After this new Installer I was able to go in and configure DirSync as described in my previous post here. 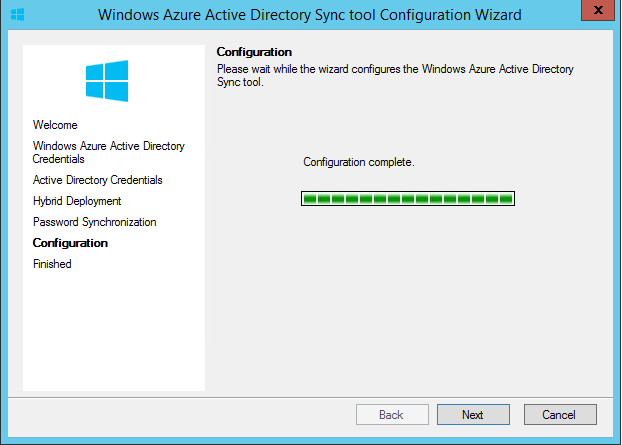 The DirSync configuration wizard ran as normal and as expected. 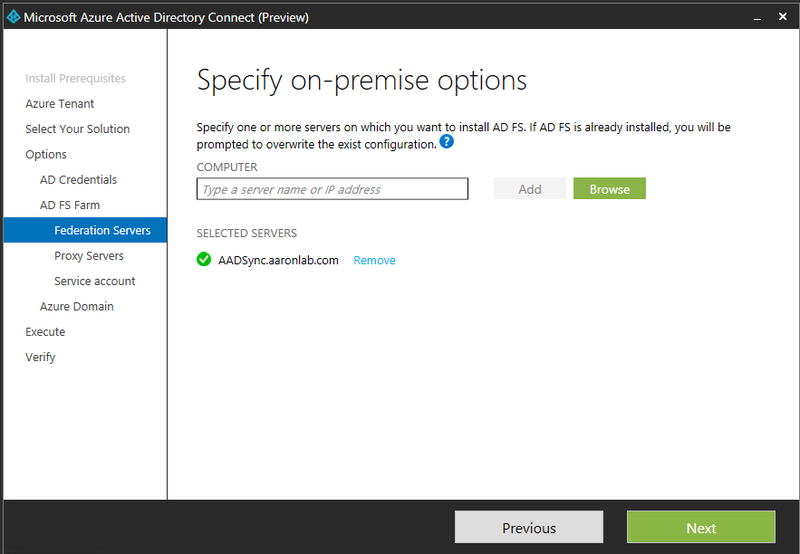 The location to administer dirsync changes is in the location shown below. 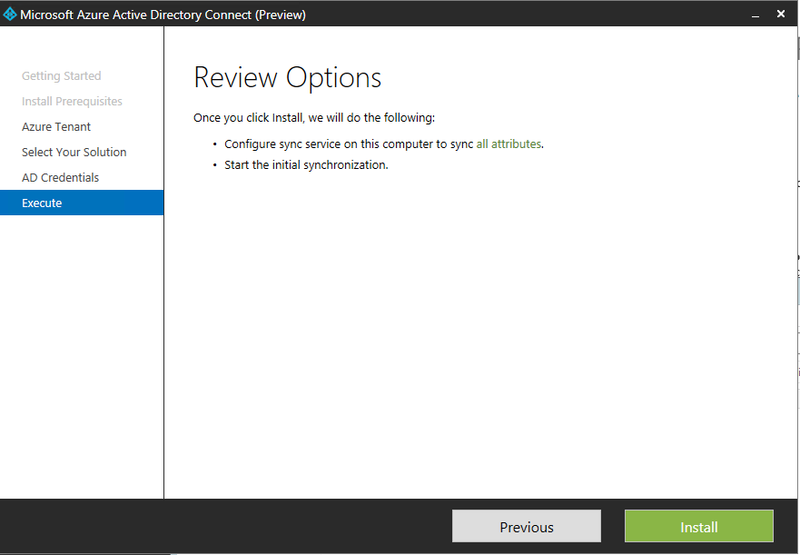 This is still no DirSync app showing on the desktop or under programs. 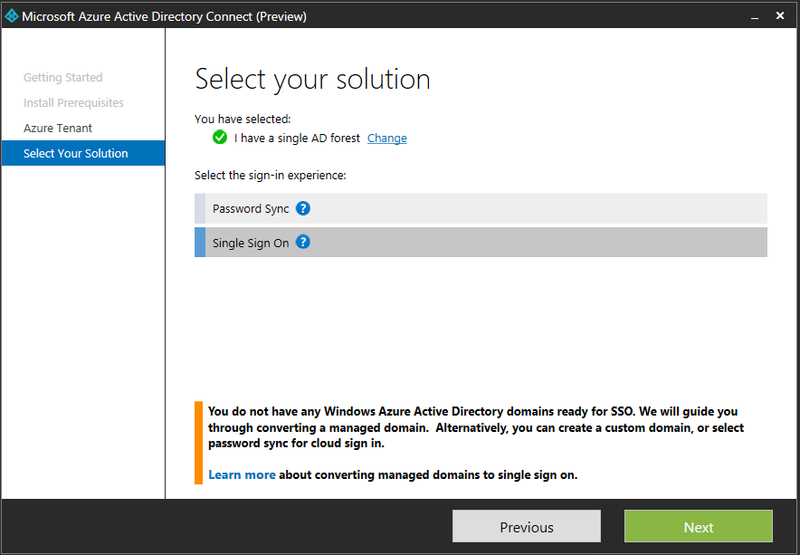 Here are the steps for SSO configuration. 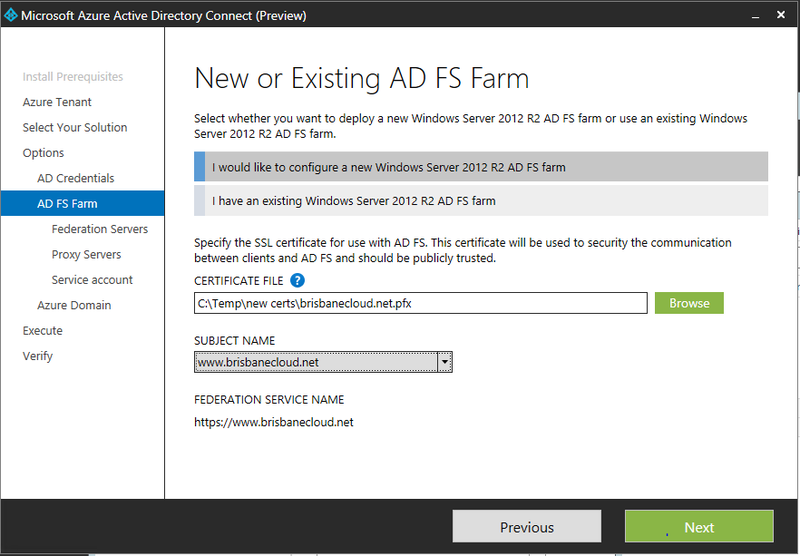 I went away and purchased brisbanecloud.net, then created a free public trusted certificate. 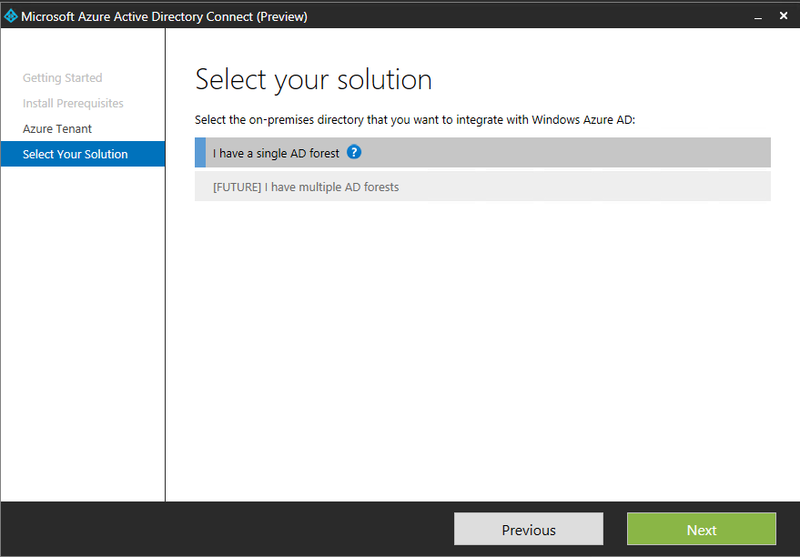 Then I re-ran the Azure AD Connect Preview shortcut located on my desktop for a second time. 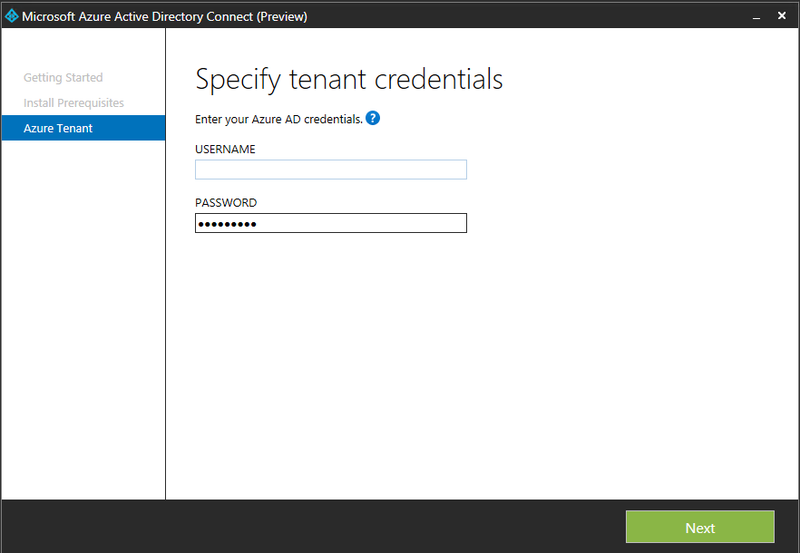 Here you can see that my Office 365 credentials (now also Azure creds) were required. If you go into the installer and press back a few times as you can see it saves your settings (only for that install session). 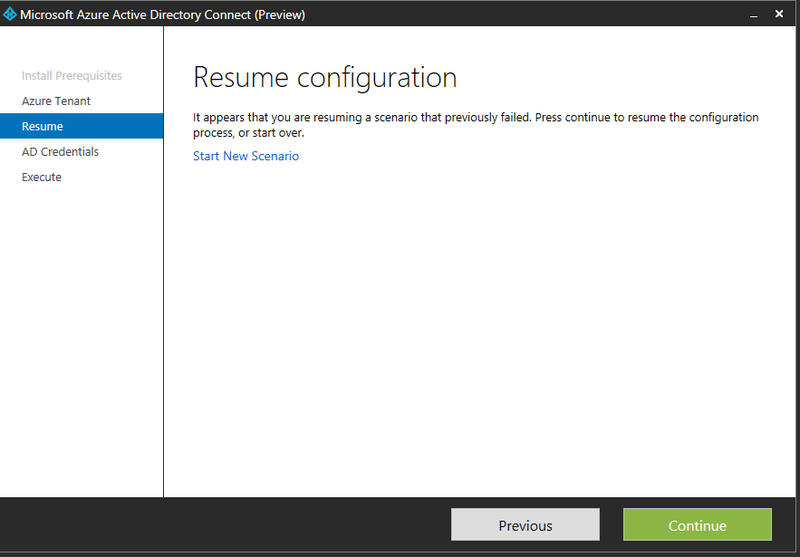 I selected Continue, entered my Active Directory credentials, next. Here I browse and select my Public Trusted certificate. It must be in PFX format. I enter my password. From the drop down I select the URL. Error: Subject name must have www. I went and renamed my pfx file and reloaded it to fix this issue. 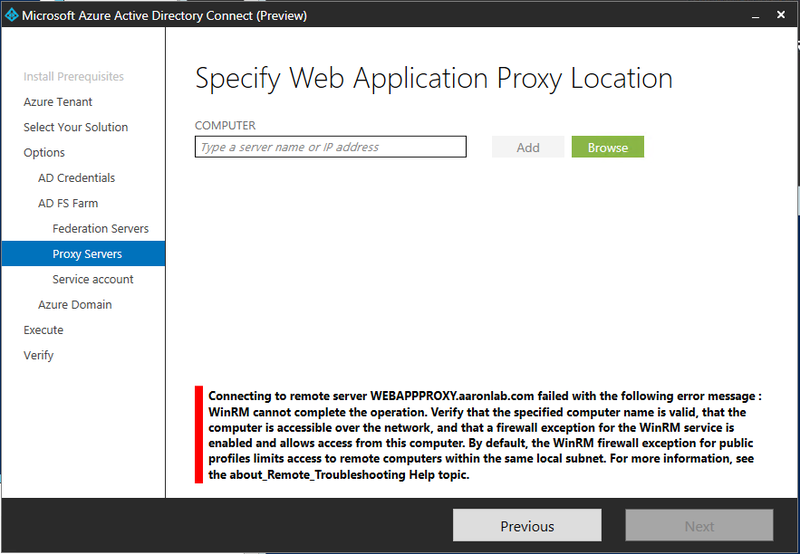 Error: Here I had to enable PSRemoting on the WebAppPrxy server via PowerShell. 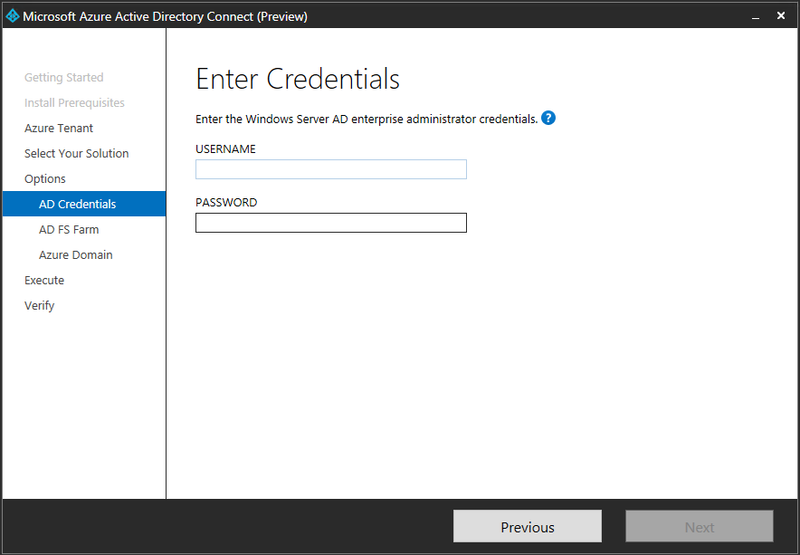 Then I entered my same Domain Admin credentials (Enterprise admin was required), next. 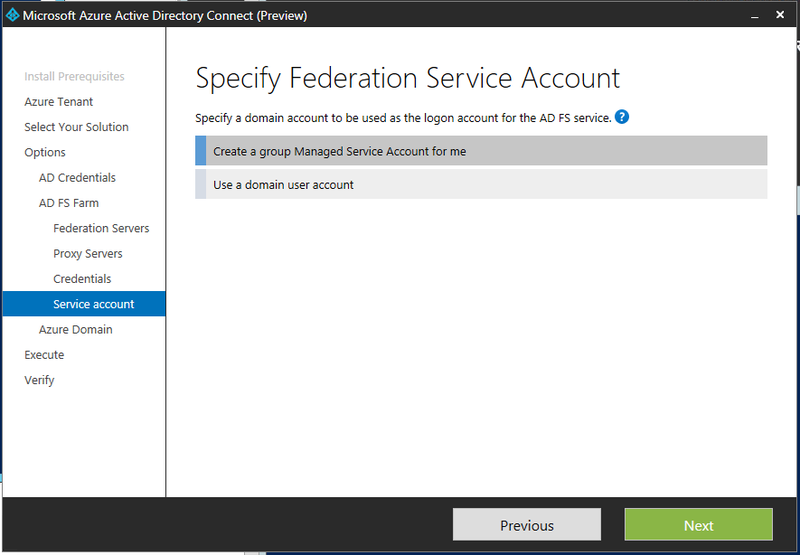 Then I selected Create a group Managed Service Account for me and next. Then from the drop down I had this error. Error: The domain needed www. in it. 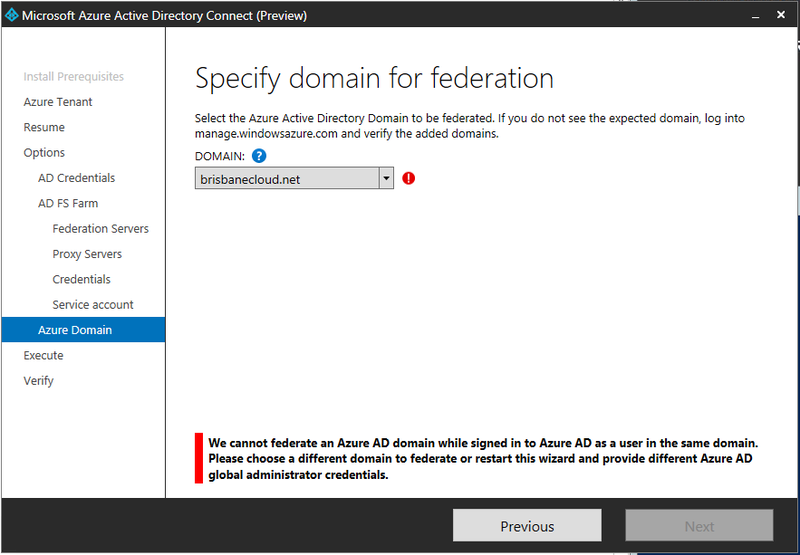 I went to Azure as it mentions ‘Azure’ in the error and verified http://www.brisbanecloud.net under domains in Active Directory (WAAD) as shown below. Back on the installer there was no update to my latest change. 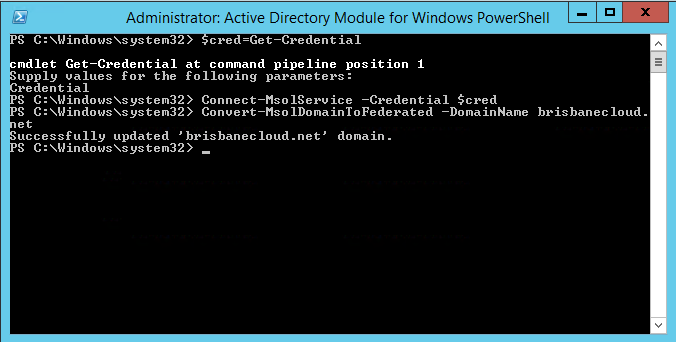 I went and removed the domain from Azure and then added http://www.brisbanecloud.net within Office 365 domains. Immediately after a press of previous and then next on the installer, I was able to see the correct address of www.brisbanecloud.net. After reviewing the options I also selected Configure password hash. The installer started and things looked good. Then I received another error. 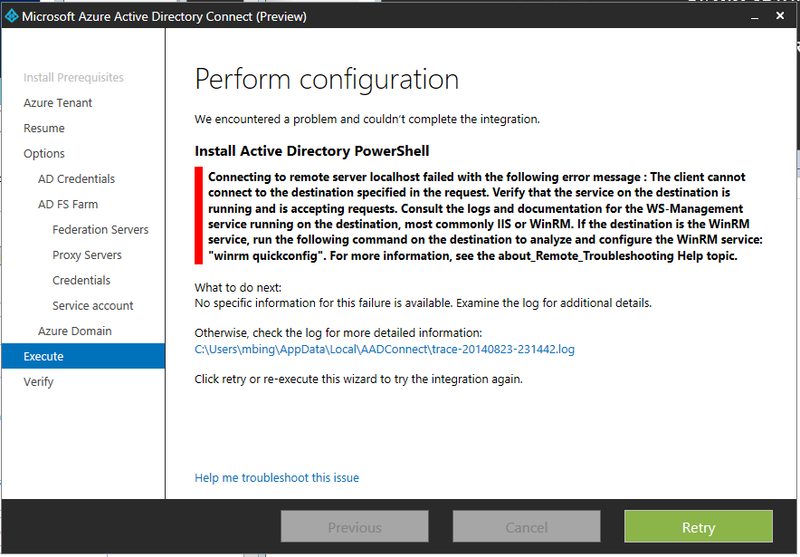 Error: Can’t remotely install Active Directory PowerShell. After getting the same error a few times, I ran the following on WebAppProxy, DC, and AADSync servers. Then I selected retry to attempt the install again. Error: An error occurred while executing the ‘Convert-MsolDomainToFederated’ command. 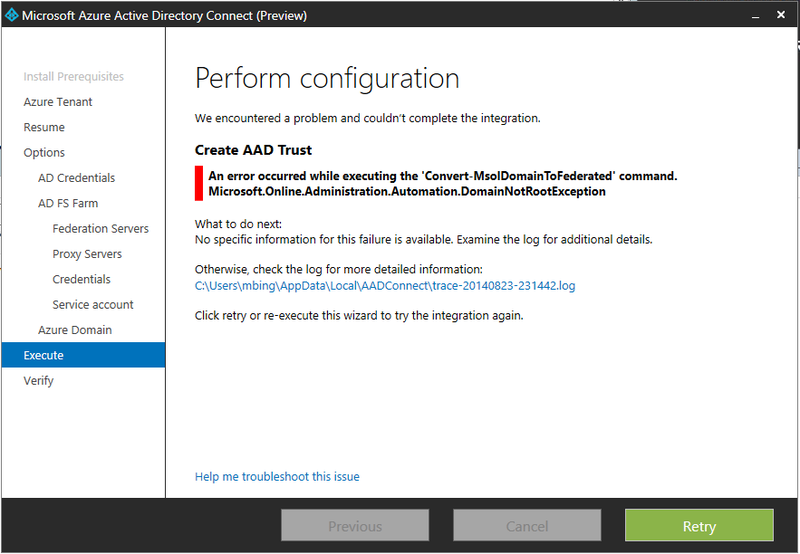 Microsoft.Online.Administration.Automation.DomainNotRootException —> Microsoft.Online.Identity.Federation.Powershell.FederationException …… The task ‘Create AAD Trust’ has failed. So them I though I will just run this command manually with an Administrative PowerShell. Error: This was a credential issue since the user account is now syncing. 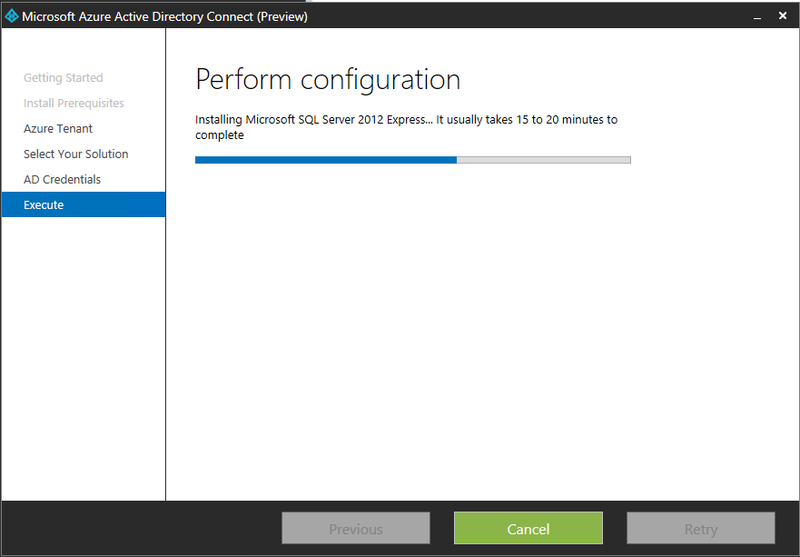 I needed to change the credentials so I closed it and went to re-run the installer again (as there was no back button). I thought I should try to manually run this command in PowerShell. Please get in contact with Aaron to nominate any member sessions that you would like to do. 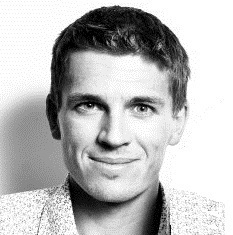 Do an Office 365 exam for free.. Send your request to ‘MPNTrainingDM@microsoft.com’ to recieve your free beta exam vouchers.